Applications are now being accepted for the Lake Forest Park Farmers Market’s 2016 Holiday Crafts Fairs. Local and Washington-based artists and crafters of all kinds are encouraged to apply. 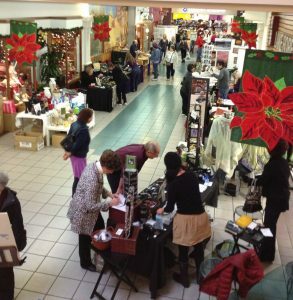 This holiday season, shoppers will be treated to two indoor holiday crafts fairs where they can find unique and one-of-a-kind gifts for everyone on their holiday lists. The first will take place on Sunday, November 20th, right before Thanksgiving and the crush of Black Friday. The second holiday crafts fair will take place on Sunday, December 18th, just in time for that last minute Christmas, Hanukkah, and New Year shopping. Each market will take place from 10 AM to 3 PM and will correspond with a simultaneous farmers market. Crafts markets will take place in the lower level of Lake Forest Park Town Center while the farmers markets will take place outside (weather permitting) in the usual location in front of the Professional Building. (In case of inclement weather, farmers markets will move inside to Third Place Commons on the upper level of Town Center.) An additional farmers market (with no crafts fair) will also take place on Sunday, November 6th. The application deadline for all interested artists and crafters is Wednesday, October 5th. All applications must be complete and received by October 5th to be considered for these juried events. We encourage artists and crafters of all kinds to submit applications for consideration. Applicants are asked to submit a completed and signed application form, three labeled photos to represent current work, and a photocopy of current Washington State Business License. A table/stall fee must also be submitted with the application, but will be returned to applicants not selected to participate in crafts markets. 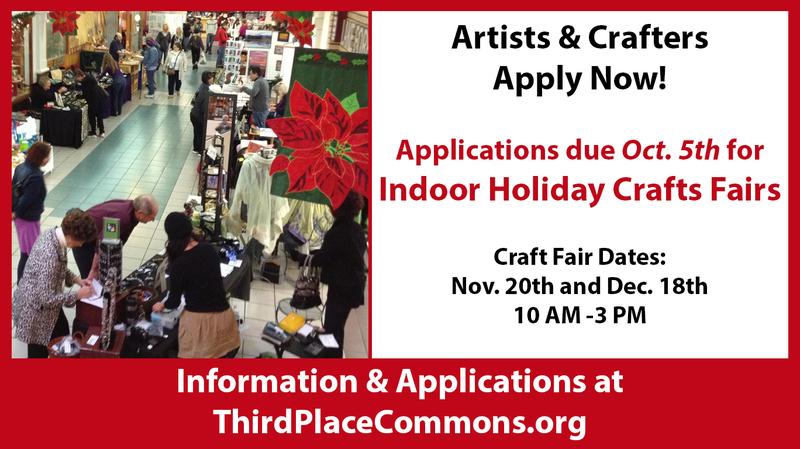 Please visit the Information for Farmers and Crafters page and review the Holiday Crafts Markets Application carefully for full details. All items presented at the Holiday Crafts Fairs must be handmade in Washington by the individuals selling at the market. We seek a wide variety of media to represent a broad spectrum of creative endeavors and look forward to seeing your submissions! Holiday Crafts Fairs and the Lake Forest Park Farmers Market are presented each year by Third Place Commons, a community-supported nonprofit organization dedicated to fostering real community in real space. Third Place Commons is located at 17171 Bothell Way NE, Lake Forest Park, Washington 98155. Previous Post: Free Latin Music Series Starts September 2nd!